Some important lessons on dealing with loss from a recent generation-defining struggle in New Zealand: the Save Happy Valley Campaign. We do our best to win campaigns, but what do we do when we lose? How do we recover, find footing and carry on? Some important lessons can be drawn from a recent generation-defining struggle in New Zealand: the Save Happy Valley Campaign. 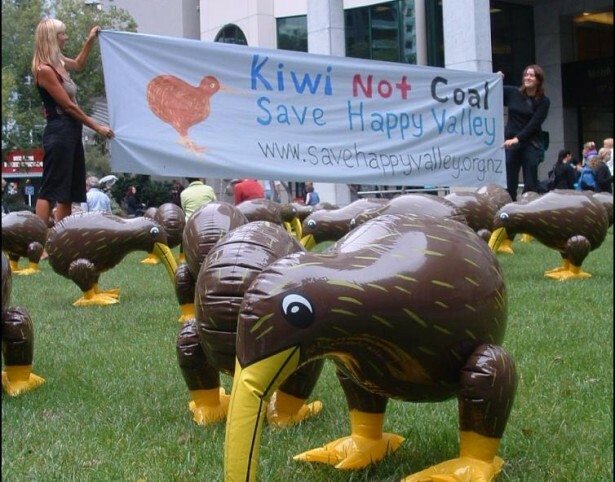 The campaign has been protecting Happy Valley from invasive coal mining since 2005, including the country’s longest running environmental occupation. Just a few weeks ago their campaign was dealt a major hit when Solid Energy bulldozed much of the targeted land to open up mining, despite the low price of coal and low return on investment. Destroyed in the untouched landscape were the homes of 30 threatened great spotted kiwi and land where a rare carnivorous snail and eleven other endangered species lived. Recently I had the chance to work with some of the activists in that campaign while leading a three-day training of trainers for climate change organizers in New Zealand. While its too early to say if the entire campaign has lost, my time with them gave me a chance to think about lessons on when we do experience loss. We experience no real sense of loss without opening up our hearts to what we’re fighting for. The campaigners fell in love with the land at Happy Valley, a red-tussock wetland in the southern island, near the town of Westport. For many of them it was their home during the three-year site occupation, in which activists rotated through the role of occupier in the remote pristine landscape. So when activists emailed around images of the bulldozed land, reactions ranged from shock, sadness and white-hot anger, to a mix of despair and a desire to move into figuring out what to do next. The first morning of the workshop hardly any of the activists spoke about news from the campaign. “Seeing the pictures just felt overwhelming,” said Jojo McVeagh, one of the activists. “I don’t want to process it at all.” Other than seeing faces that look locked in a kind of grimace, I didn’t hear much about the campaign. During the evening session I saw some of the grief beginning to rise. A pair of activists began quietly talking to each other about some of the loss — the first time I had observed that in the workshop. The sharing was quick, almost surreptitious, as if by admitting it was real to each other it might cement the loss. Along with my attentive listening, the two began making space for each other to share more. As they talked, I was struck by how much had to do with all the other hard things surrounding the campaign — the movement’s internal struggles and conflicts. I found myself, even though I had nothing to do with the campaign, on the edge of tears as I was feeling all the pain from my own lost campaigns, missed opportunities and lost relationships. Part of handling the loss is dealing with the pain that gets triggered as well. The more a movement can address despair along the way, the better shape we’ll be in if and when we lose. The next morning the work of the pair had inspired other pairs to share. I spent time with one of the pairs in the kitchen over breakfast. They were focused on how to help their people pivot to the next campaign. One openly worried about people staying stuck in emotions and grief and not moving to the next action. I diligently wrote all the responses on newsprint for everyone to see. Then, after exhausting the range of emotions in the room, I announced I wanted to share with them a theory about what movements do when they experience a half-loss, half-win. The group waited with baited breath, pens in hand. With a twinkle in my eye, I read them back their list, sharing a few stories as examples along the way. My goal here is normalizing — to affirm to people that their reactions are normal, and rather than fighting inside themselves to “shape up and be the right kind of activist” — one who goes right back to the battlefield or who does some kind of magical clean crying — for each person to be comfortable with their own set of reactions, open to their own genuine way of handling the challenge in front of them. Shame doesn’t inspire us back to action. Or, if it does, it is a nonrenewable fuel for action. People need spaces to heal — and initiatives must be taken to help design those spaces. Ahead of the mid-morning break, activist Emily Bailey raised her hand and said, “Anyone interested in debriefing the Happy Valley campaign, join us for a tea break conversation.” A third of the group — some involved and some only peripherally involved — head off with her. I couldn’t be more delighted. The group is moving from very private reflections to larger, more public reflections. This is an important phase. Movements cannot move through grief without individuals doing reflective grief work. At the same time, individuals doing that work need to have spaces to share those reflections back with the larger world. I sat in for a few minutes to observe. I saw laughter and tears, physical affection and an airing of grief. Those who’ve been sharing in pairs appeared to be leading the way; they’d already worked through some of the grief and were efficient at sharing. The isolation that trauma had created melted away and community bonds were strengthened. The creation of space for handling grief is needed: Whether through community rituals (Save Happy Valley Campaign once created a whole ritual to honor the death of a particularly important tree), or through group humor (one activist tells me they used to play a game called “isn’t that terrible?” where people would share their woes and the activists would affirm them by saying, “yes, isn’t that terrible!?”). At the end of the workshop, the group of activists had developed a plan to support each other and debrief, including organizing a movement-wide debrief, split into two parts: “space for us to regroup and share some of our feelings and make sense of what happened” and a “brainstorming and planning session.” People were invited to come to either part, or both. At this stage of healing the activists were ready to take the feedback of all the many things the movement had won. Younger activists shared how this campaign was the campaign that inspired them into action. Older activists shared how this campaign kept them motivated and encouraged them to become more radical. The activists were able to hear it and take it in. Even through the loss, they began to paint a bigger picture: Not everything in Happy Valley was destroyed and in fact the company has only started mining a small section of the land. There are still forests left to protect. In the broad sweep of the climate change movement, this may become a turning point for other wins down the road. Many movement leaders are now skilled up to move on to other campaigns. Other leaders were burned out by the campaign, a testament to the need for increased group support, which was a lesson the younger activists took to heart. Their process mirrored that of many campaigns who suffer loss: doing healing individually and through small groups, then through larger groups, and eventually feeding back into the larger movement. It reflects the need for active creation of processes and structures to help people move forward through their grief, even while mirroring the psychological stages associated with handling grief: shock, anger, disorganization and eventually regrouping and innovation. Thanks for a really unusual report from the front lines. As I read it I realized how unusual it is for activists to share this side of our reality, probably one more consequence of the patriarchal theme that even revolutionists should adopt a super-hero’s contempt of “softness.” I also appreciate your showing us how a trainer can move with a group, sensitively supporting its natural process without imposing a lot of “oughts” and “shoulds,” gently transforming its “not-really-OK-to-grieve” norm into grieving as a source of power. I’ve seen it in black working class funerals; why shouldn’t white middle class activists be supported to experience the birthright of all human beings? Thanks for modeling deep, empowering work, and showing us it’s not impossible for the rest of us. You are such a gift to movements and campaigns for peace and justice!! !